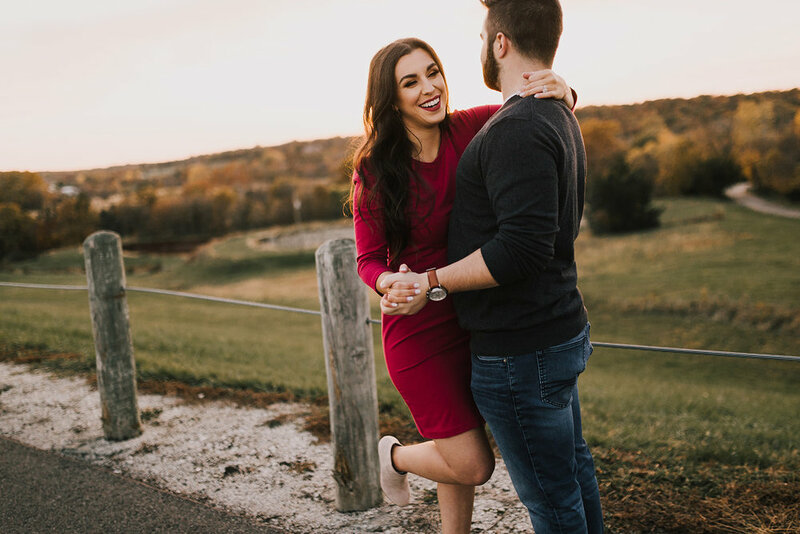 Well babes, I figured it was definitely high-time I share with you all my engagement photos recap! Before I jump in, I want to introduce you all to our AMAZING wedding photographer, Alyssa Barletter. IMO, she is one of the most talented photographers out there. Not only is she absolutely fantastic at capturing raw moments, she is incredible at helping to bring those moments out by making you feel comfortable and beautiful. If you are looking for a wedding photographer, engagement photographer, couples shoot photographer, etc... I would 100% recommend Alyssa without hesitation. Lear more about Alyssa here and get in contact with her here! And if you are looking for some major wedding insp, give her a follow on Instagram! Over the past year, I feel like Logan and I have become pros at couple portraits. 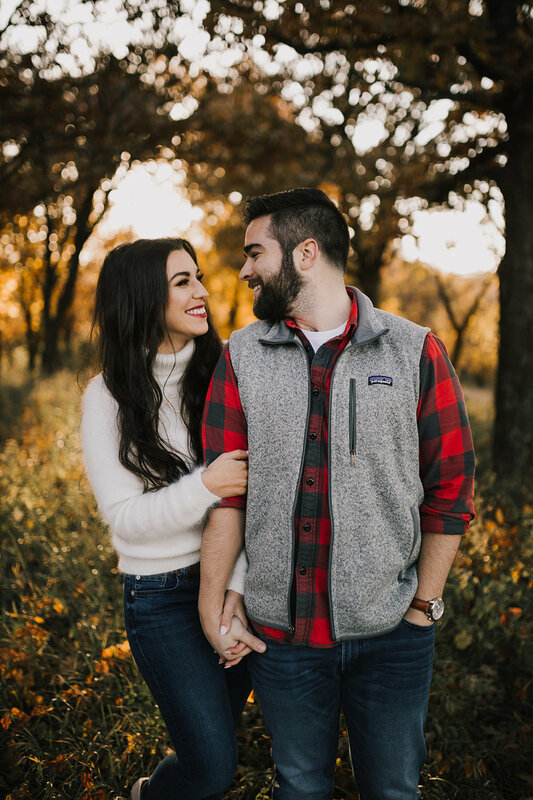 From our engagement day photos, to family photos on the beach, to our engagement photos, to Christmas card photos, to blog photos... we've basically taken couple portraits every other month! So... I wanted to share a couple of tips to help you maximize your time with your photographer and feel comfortable in front of the camera. We tried on our outfits TOGETHER beforehand. This helps you visualize how your looks will look next to one another. So often, we are used to how our look comes across individually so it is important to build your looks together. This also helps you better accessorize and ensure nothing comes across too bold. We sat down with our photographer beforehand. Meeting up for a drink or two with your photographer really gives you all a chance to get past the formalities and understand how the opposite party works. When we met up to have a few beers with Alyssa, we were able to hear more about her process and she was able to get a feel for who we were as a couple. I think this really helped us jump into the swing of things at the start of the shoot rather than spending time warming up to one another. We had a little liquid courage. Logan isn't the most comfortable in front of the camera (after all, he basically lives behind a camera as my IG hubby now). So I wanted to be sure to loosen him up a bit at the beginning of the shoot. We love being outdoors, and so I found these ADORABLE mugs that would look great with our outfits, go along with the theme of our shoot and allow us to sip a bit of spiked cider. So I suggest getting creative with ways to utilize the beginning of your shoot time to have a couple of drinks. Reason 1 million why I adore Alyssa - we brought her a mug and she had a drink with us! We had fun with it! Knowing that Logan was a little nervous, I prepared a couple of super cheesy jokes to pull out when needed. This is just very US and made both of us laugh and have so much fun. We got out of our comfort zone. Be open to trying new things, posing your body differently, saying goofy things, etc... It may just result in a photo that you absolutely love! WE TRUSTED OUR PHOTOGRAPHER. Y'all, I can't say this one enough. They are the professional. Take their advice, trust their process, because they know what works. But on the opposite end, we communicated our wants/ideas with our photographer. If we had an idea, we were sure to talk with her about it and get her opinion. This helped us really make the photos "ours" while also relying on her expertise to make them happen. We didn't try to replicate a Pinterest board. As much as I LOVE Pinterest, it can also end up setting expectations for us. Don't try to be your favorite pin, let it inspire you to be who you are as a couple. We weren't judgmental of ourselves. I am the first one to admit that I can be overly critical of my look or body. But when we received our gallery, I really went into it focused on our personalities shining through rather than how I looked individually. And because of that, I absolutely love every single photo that came out of our shoot. I knew that I wanted our photos to perfectly represent who Logan and I are as a couple. So the first thing that we tackled was location. During our initial meeting with Alyssa, we chatted through potential outdoor locations. 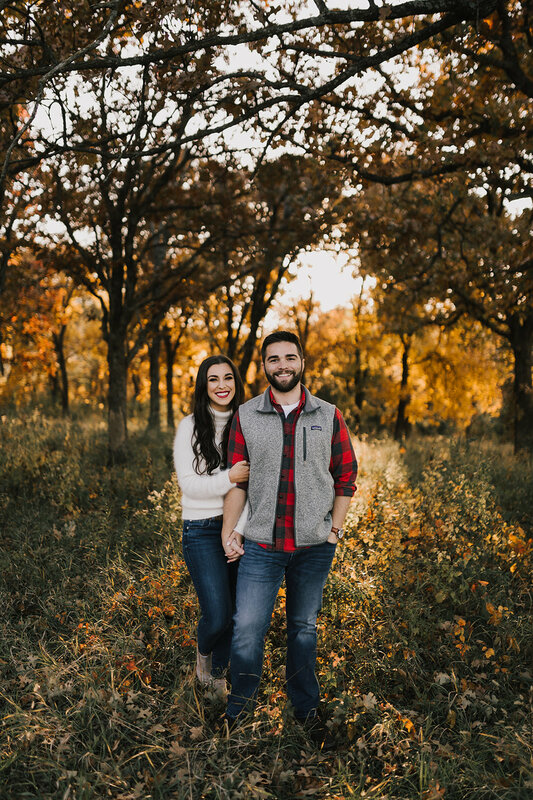 Since there wasn't an outdoor spot that holds a lot of meaning to us (well, one in the United States - looking at you beautiful Thingvellir), this goes right back to tip #7 - we completely trusted Alyssa's recommendation and went with Shawnee Mission Park. And I am SO incredibly happy we did. The lighting was perfect, the trees were gorgeous, the backdrop options were limitless. Once our location and time of year were locked down, I started focusing on our outfits (DUH). So we started at the obvious destination for ideas... Pinterest. I showed him a couple of color schemes/outfit pairings that I loved and got his feedback. We narrowed it down to a few looks that we wanted to make our own. My primary concern was that Logan felt comfortable in what he wore and knew he was a part of the process so we focused on his attire first. I knew that his favorite outfit (a flannel with his Patagonia and fav jeans) matched the style that we were going for. Then we started looking for a dark top for a more styled second look. Once we finalized his look, I knew I wanted whatever I work to compliment it. So when he had a pop of color, I knew I wanted to wear a more neutral color. This worked perfectly because I had hoped to wear a little bit of white for that "bridal feeling." I honestly couldn't be happier with how these turned out. In complete transparency, I bawled in the middle of a work day when I saw them. I am so extremely thankful that I was connected to Alyssa because she truly captured Logan and I's relationship so perfectly. 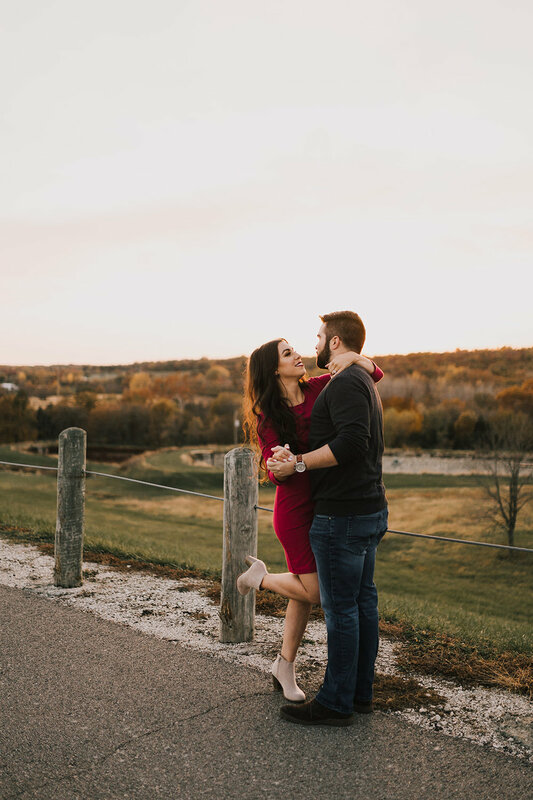 I can't wait to see how our wedding photos turn out!